PM2.5 pollutants will be closely monitored in 2019 in the Beijing-Tianjin-Hebei region, the Yangtze River Delta and the Fenhe and Weihe plains in Shanxi and Shaanxi provinces, the Chinese environmental protection authority said on Monday. Liu Bingjiang, director of atmospheric environmental management with the Ministry of Ecology and Environment, made the statement during a monthly press conference. The ministry will not loosen its law effort when it comes to treating heavy pollution, and reducing PM2.5 (a key indicator of air pollution) will continue to be prioritized, Liu said when asked how to coordinate the relations between economic development and environment protection against the downward pressure on the country's economy. China's GDP grew 6.6 percent in 2018. Although above the 6.5 percent annual target set by officials at the beginning of the year, this was the lowest growth rate since 1990. The ministry pledged an array of measures on Monday to combat heavy air pollution, which included increasing its precise management capability in treating heavy pollutions, and guidance to help enterprises reduce the emission of pollutants, Liu said. According to data the ministry provided to Global Times on Monday, China's air quality has continued to improve in 2018, with 338 major cities across the country reporting good air quality on 79.3 percent of days, up 1.3 percentage points from the previous year. As part of the effort to fight against pollution in 2018, the sales of new energy vehicles reached 1 million, and nearly 700,000 charging areas have been installed across the country. More than 2 million old, highly polluting vehicles have been removed from usage. Liu Youbin, the ministry spokesperson, on Monday urged environmental protection regulators at the provincial level to hold press conferences routinely; a minimum of one press conference every two months was recommended. The spokesperson also announced the contact information for the information office of provincial environmental protection regulators for 31 provincial regions, welcoming media to engage with these departments to inquire after information of new issues or emergencies. At the Monday event, ministry officials also commented on a recent charge by the South Korean media which have reported that China has caused South Korea's smogs. 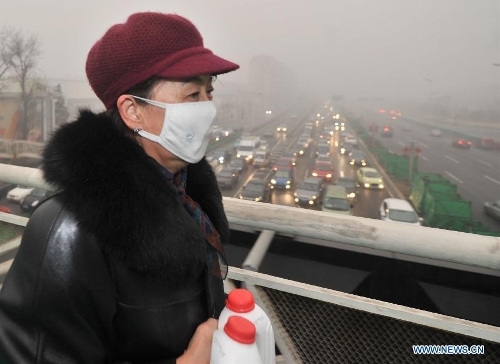 "Admittedly, two-way transmission does exist between the two sides under special weather conditions, but it has yet to determine how such transmission would impact air quality," Liu Bingjiang said. "While China has improved its air quality by over 40 percent, air quality in South Korea remains largely the same or may even have deteriorated slightly. South Korea will miss the opportunity to address its smog issues if it simply hurls accusations at others," Liu Bingjiang noted.